Former prime minister Atal Bihari Vajpayee's niece Karuna Shukla on Thursday joined the Congress and slammed the Bharatiya Janata Party’s prime ministerial candidate Narendra Modi, saying his promise of serving the country is nothing but "plain dishonesty". Hitting out at Modi, Shukla said the BJP has a prime ministerial candidate "who did not fulfill the duty of a husband or rajdharma when he was the chief minister. If such a person talks about rashtradharma, I will call it plain dishonesty". Welcoming her into the party fold, All India Congress Committee general secretary in-charge Janardan Dwivedi said her joining Congress has a symbolical value. “Karuna Shukla, who was brought up imbibing the value system of a person, who had immense contribution in the making of BJP, has severed ties from that party because of bad culture that came there in recent years. The event has a bigger dimension for us as leaving that culture, she is joining the Congress, making an exit from one particular value system to the other," Dwivedi said. Shukla, who became the Member of Legislative Assembly from the BJP in 1993 and was one of the party’s senior leaders in Chhattisgarh, was unhappy over being sidelined and had openly criticised the BJP leadership, including Chhattisgarh Chief Minister Raman Singh, on many occasions in recent past. 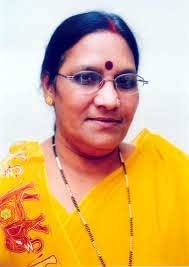 A former Member of Parliament from Janjgir constituency of Chhattisgarh, she had lost the 2009 elections from Korba to Charan Das Mahant of the Congress. She resigned from the BJP on October 25 last year, alleging that the party was "under the grip of power politics". Ever since, there was speculation of her joining the Congress. Shukla had also met Congress President Sonia Gandhi recently. Shukla's decision to join the Congress was announced by the party with much fanfare with senior Congress leaders Dwivedi, Motialal Vora, B K Hariprasad, Ajit Jogi, Chhattisgarh Pradesh Congress Committee chief Bhupesh Baghel and Congress Legislature Party leader T S Singh Dev accompanying her at a press conference at the AICC headquarters. She was one of the national vice presidents of the BJP as well as the former national president of the BJP Mahila Morcha, besides holding other posts in the party in past. Shukla praised the ideology of the Congress and the "sacrifice" of the Nehru-Gandhi family. She expressed confidence that the people will support the party and not the BJP, and the 2014 Lok Sabha elections will mark the end of "communal forces". Attacking Modi, she said people of the country will never allow such a person to become the prime minister. "Let him trumpet about the wave. It does not take time for the weather to change. Waves change fast," she said. "I served the BJP for 32 years. The kind of degradation that has happened in the BJP since the last 7-8 years is unparalleled. After Atal Bihari Vajpayee fell sick, a group has in a way captured the BJP," she said. Shukla claimed that her "pain" with the affairs in the BJP is not an individual grievance and "there are many who are undergoing this pain due to the total seize on the party by this particular group". She said that she felt "humiliated" in the BJP and felt it was difficult the preserve the original ideology any more. To a question as to whether she was referring to Modi or Raman Singh by her refrain that the BJP had been captured by a group, she said when she is speaking from the national office of a party, her allegations are directed against the national leaders. In the same breath, she praised the Congress, saying the people of the country know about the sacrifices made by the party and the family (Nehru-Gandhi). "Vajpayee's house (BJP) was my first house. My Vajpayee mayaka (parents' home) is no more due to the end of the Atal era. Congress is my new house and I have to learn many things here. This party and this family have a glorious history. This party never butchered democracy. I feel proud to have joined this party with a rich heritage and history," she said. Shukla, however, refused to go into the Modi versus Rahul Gandhi comparisons, but vowed to "expose the dynastic politics of BJP", saying she knows everything about the party where she had worked for 32 years. Jogi said that Shukla' decision to join the Congress was a milestone and welcomed her entry on behalf of all those following the secular polity.